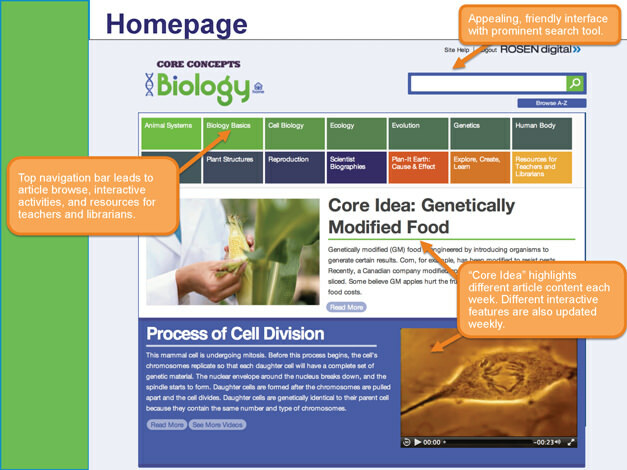 The second database in Rosen’s Core Concepts suite encourages students to think like scientists! Supporting STEM and the Next Generation Science Standards, this rich resource covers the study of life from adaptation to zooplankton, and includes such topics as animal systems, cell biology, ecology, genetics, microbes, plant structures, and more. Interactive Plan-It Earth: Cause & Effect activity shows the impact that even small changes can have on ecosystems—student decision-makers call the shots! Those seeking a thorough look at biology that goes beyond the birds and the bees will be pleased…a seamless format that instructors will find incredibly useful and students easily accessible.